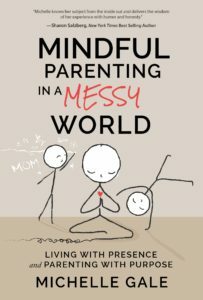 Guest Post: Mindful Parenting In a Messy World by Michelle Gale, author, Mindful Parenting in a Messy World | MotherhoodLater.com - World’s leading website, eZine and community for midlife moms. Let’s face it: life is messy. And when you add parenting to the mix, you discover levels of messy you never even knew existed, both literally and metaphorically. How can we parents keep our sanity amidst such chaos? Here are a few ideas. Whenever our children trigger our anxiety, they actually do us a favor. No, really — stay with me here. They may send us into orbit from time to time, but their tormenting of us is precisely what we need. When I allow myself to learn from my children, they generously guide me towards emotional growth. As I face up to my immature outbursts, my inclination to be a neat freak, or my insistence on not being a second late, by calming myself instead of exploding — addressing my children patiently and kindly rather than as a maniac on a mission to get something done — I grow in ways I never could have imagined before becoming a mother. The key for me was to learn to stop myself as I’m about to react, tune into what’s really driving the emotion I’m experiencing, and settle myself down. It’s so clear to me that my children, with all the chaos they bring with them, have come into my life to give me a wealth of practice at this! However, if it wasn’t for my meditation and mindfulness practices it would be really difficult for me to notice my big emotions and tune in to my negative reactions before they get going. Don’t let inexperience or busyness stop you from incorporating the sanity mindfulness can offer into your life. You don’t have to do it “right,” you just have to do it. Anytime is a good time to meditate: If you read about the best time to meditate, you will often find suggestions to practice at the same time each day. Although it’s a great concept, it just doesn’t always fly with busy parents. In the past I’ve sat in my children’s room as they fell asleep, in the parking lot of jiu jitsu class, while waiting in the doctor’s office, or in my bed before I go to sleep. Take the moments you can get. Focus on breathing: If you do nothing else, spend time each day noticing a few breaths coming in and out of your body. You can do this while waiting in line at the grocery store, in the bathroom, during boring work meetings, or while on the phone with that family member who drives you crazy. Even better, sit or lay down with your eyes closed for a few minutes or more. Allow yourself to focus only on your breath with intention and notice how you feel when you are done. Pay attention to your body: We hold an incredible amount of stress in our bodies. I often find myself driving my car with my shoulders hunched, jaw tight, and barely breathing. What a funny scene. I’ve learned to notice when I’m holding tension in my body by doing a quick body scan and then giving myself permission to release any tension I find. Try out some guided meditations to get you started if you have 10 – 15 minutes to gift yourself. I never underestimate the universe’s wisdom. I’ve learned that when it looks like things are careening out of control and the very worst is happening, divine wisdom is right in the thick of it all. The messier the situation, the greater the potential to become more aware. This is good news because the mess is everywhere at times. Practicing mindfulness involves recognizing that life in a family is a setup for our learning as parents, and only secondarily for that of our children or partner. Of course, there’s learning to be had on their part, but this can’t be our focus when we’re seeking to grow. The path of self-development requires us to detect the setup in all the myriad situations that invite a reaction from us. Whenever I feel upset by something, I know that I’m being set up to grow. When someone says something about me that seems so wrong or does something really irritating, the challenge is to try and identify with even the one or two percent of what they say that’s spot on so that I have the opportunity to learn from them. If there wasn’t learning to be had, I wouldn’t be reacting. Any level of reaction points to an emotional charge that is worth addressing and exploring. 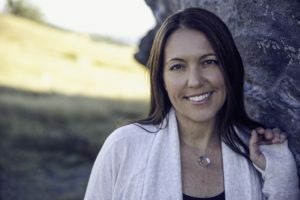 Mindful Parenting Educator Michelle Gale, MA, is a former head of learning and leadership development for Twitter who teaches parents to better connect with their kids by first connecting with themselves. She is the author of the new book “Mindful Parenting in a Messy World,” an Amazon bestseller. Visit www.BeAMindfulParent.com.